This film adaptation of the book of the same name is the classic tale of the kids locked in the attic by a dysfunctional family. The father of the family dies and so the mother returns to her gigantic family mansion with her kids in tow. The grandfather never approved the marriage and so she hides the kids in the attic. Stern grandmother acts as prison warden and the mother gradually withdraws from the kids and seems to forget them altogether as she pursues her inheritance. This has that made for TV sheen and it doesn't really do the book justice. 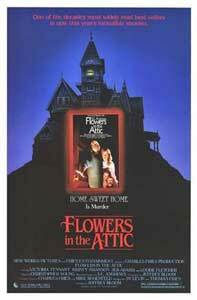 The highlight is Louise Fletcher as the scary grandmother. This is actually a really nasty tale but it is done in a lightweight way here.